I got the idea for this card from my brotherinlaw’s favorite coffee cup. It was so cute with several white sheep and one with a brown design. So when i got home from Washington (the state not DC) i had to make a card with several white and one design sheep, i may do more! I had a great stay in Sequim Washington and my sister and mom gave me a suprise birthday party…. it was a suprize since it was 4 months early. 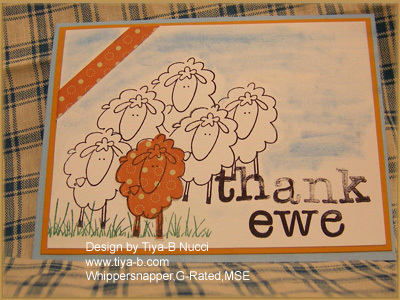 This card uses several stamps, the sheep are whipper snapper the letters are My Sentiments Exactly and the grass is G-rated Rubberstampes.